Are you excited that Summer is just around the corner? I know I am!! ? Warm Sunshine . Picnics in the Park . Fun at the Beach . Hiking . Fishing . Camping . BBQ . Back when I was a kid in Hong Kong, summer meant summer workbooks (yes! Our school teachers actually assign homework for the summer – even when we’re only in elementary school), piano lessons, swimming lessons, dancing lessons, tutor lessons…you get the idea. ? If we’re lucky, parents might get a break from work and we’d have a short vacation. But things have turned upside down when we came to North America! 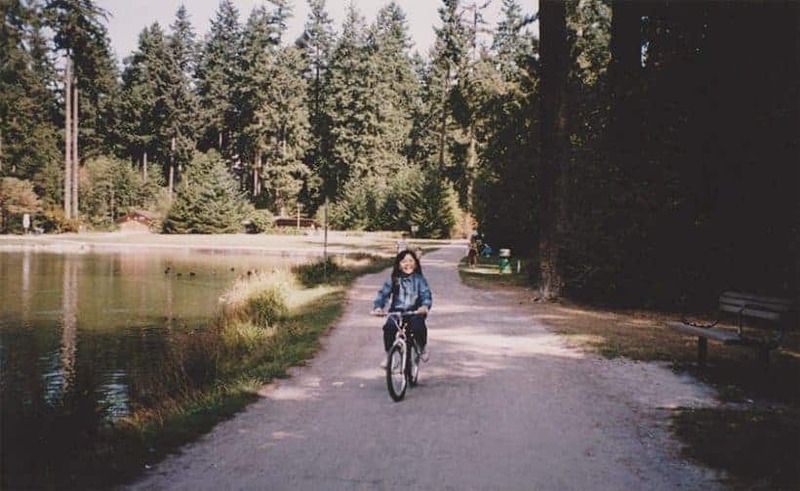 Every summer, my parents would bring us around the city to explore different parks. One last ride before school starts! We’d enjoy lovely picnics and delicious BBQ surrounded by beautiful trees and water. Dad would load up the grill & tools, along with our bikes on the car. Then, mom would prepare lots of yummy sandwiches, hot dogs, salad, corn on the cob, pop, and popsicles. Yum! After we finish our food, I’d race my brother on our bikes around the trails and go crazy like monkeys at the playgrounds. We were discussing perhaps we’ll bring our guitar, play some music and sing some songs. Let’s hope we won’t scare the little animals away! ? And, how can we miss out bringing this Instant Classic Potato Salad? In pursuit of a heart-winning bowl of Classic Potato Salad to satisfy our palates…? Time for an Instant Pot Potato Salad Experiment!! 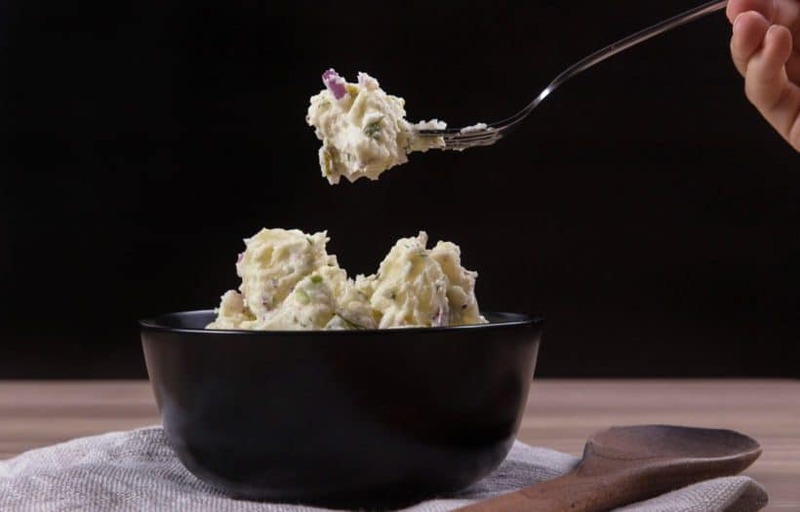 From flavors to textures, the Potato Salad is exciting in your mouth! Because life is too short for boring food! ? Potato salad might be one of easiest classic sides or party dishes that everybody seems to know how to make. I’m sure many of you have been whipping out bowls of potato salad for years! Using the wrong types of potatoes – not all potatoes are created equal! 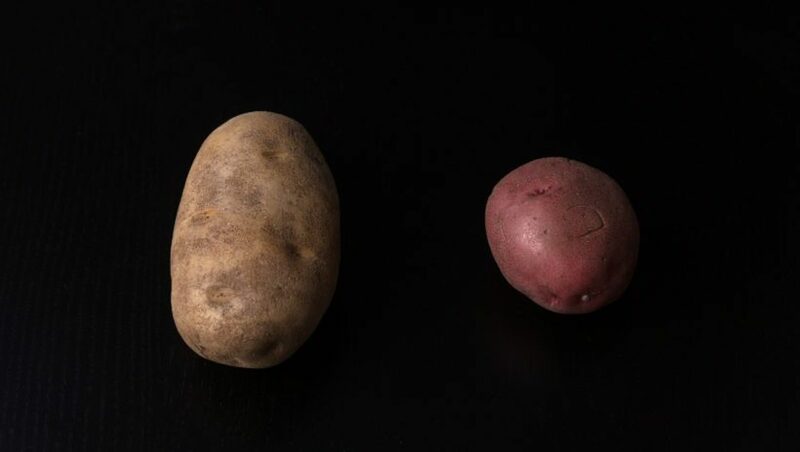 So first off, choosing the right types of potatoes. In conclusion, it’s true that Russet Potatoes absorb the seasonings & flavors better than Red Potatoes in the Pressure Cooker. Though you can taste the differences in flavor & texture, the differences are relatively minor. Now that we’re confident in using Russet Potatoes, we need to find out the perfect cooking condition to make the potatoes tender, light, fluffy, and flavorful. 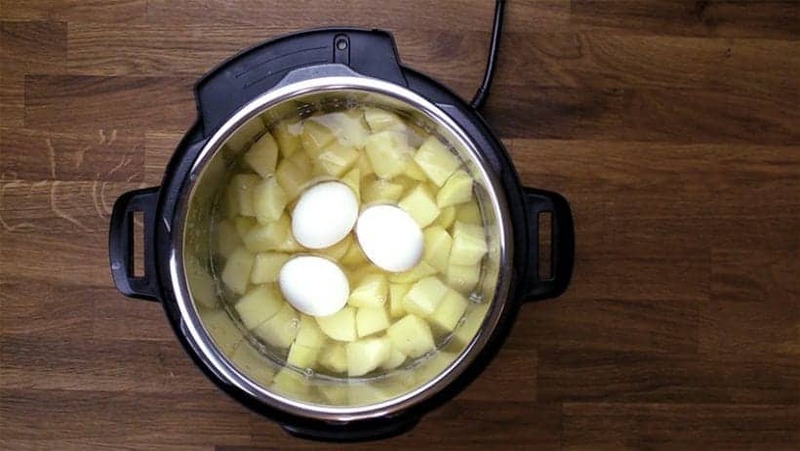 Then, we can proceed to test if it works with cooking both potatoes + eggs together in the Instant Pot. 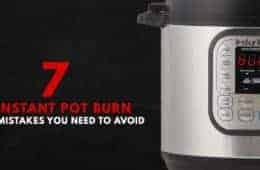 We conducted 7+ tests with Potatoes & Eggs using different amounts of liquid, table salt, cooking time, on a steamer rack or directly in the Pot in our Instant Pot Electric Pressure Cooker. We achieved our desired Instant Pot Potato Salad with Test #7. A delicious balance of savory, tangy, spiced, and sweet flavors with crunchy, fluffy, and creamy textures – so satisfying to eat!! First wash, peel, then cut potatoes into 1 inch cubes. 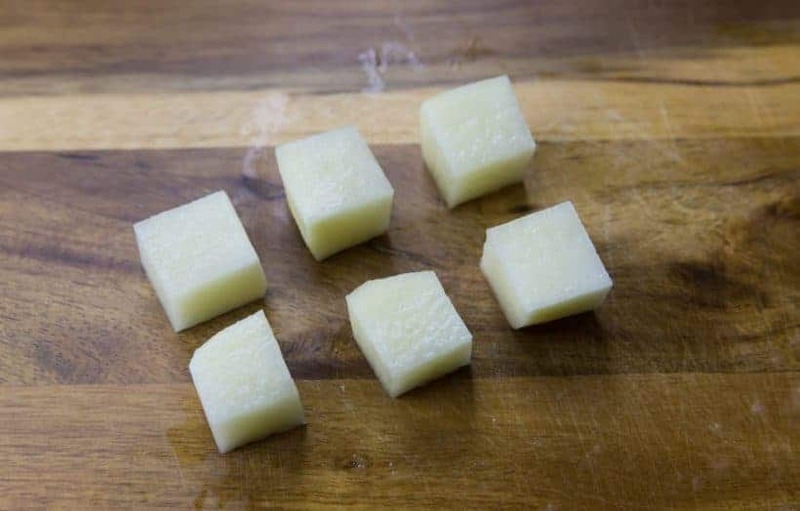 *Pro Tip: try your best to cut the potatoes evenly into 1 inch cubes – this ensures the potatoes are cooked evenly to the core & consistent among the whole batch of potatoes. Add 2 ½ tsp fine table salt, 1 tbsp (15ml) unseasoned rice vinegar or apple cider vinegar, and 4 cups (1L) cold water in the pressure cooker. Submerge all the potato cubes in the water mixture and layer the 3 large eggs on top. *Pro Tip 1: the “get up to pressure” time will take roughly 23 minutes, and the potatoes and eggs will be done. Immediately release the pressure and carefully open the lid. Taste one of the potato cubes to make sure they’re done. If your potato cubes are larger, they may need to sit in the hot water for a few more minutes to finish cooking. Place hard boiled eggs in cold water and gently drain the potato cubes with a colander. While the potatoes and eggs are cooking, prepare the rest of the ingredients. *Pro Tip: Don’t put away the knife and the chopping board as you will have to finely chop the hard-boiled eggs later. Gently layer hot potato cubes on a large tray. Drizzle and season potato cubes with 2 tbsp (30ml) rice vinegar or apple cider vinegar while they are hot. Let the potatoes cool for 30 minutes. 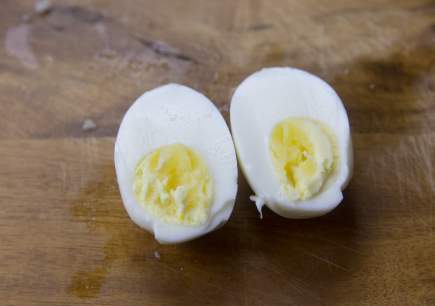 Finely chop the hard-boiled eggs once they are cool to touch. 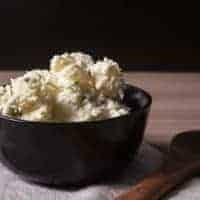 In a large mixing bowl, add 1 cup (250ml) mayonnaise, finely diced ingredients (red onion, pickle, and celery), finely chopped hard-boiled egg, 1 tbsp (15g) whole grain mustard, 1 tbsp (15ml) rice vinegar or apple cider vinegar, and ½ tsp garlic powder. Mix well with a silicone spatula. Drizzle in the finely chopped fresh dill and mix one more time with a silicone spatula. Gently fold in the cooled potatoes with a silicone spatula. Taste the salad and season with more kosher salt & fresh ground black pepper to taste. *Pro Tip 1: Don’t overmix as you don’t want the potato salad to be too mushy. *Pro Tip 2: You will want the potato salad to be a little on the salty side because putting it in refrigerator will decrease the perception of seasoning. Cover & place potato salad in refrigerator for at least 3 hours. The potatoes will harden a little once they are cooled. Serve as a side dish, bring them to a potluck or picnic! Man, I just want to swim in this creamy smooth, rich & fluffy Instant Pot Potato Salad! *Pro Tip: Be sure to print out a few copies of the recipe because I am sure someone will ask. Hehe! ? *Storage Duration: Potato salad will last for 3 days in the fridge or no more than 2 hours under a hot sun! Creamy, Crunchy, Fluffy Instant Pot Potato Salad makes an instant classic crowd-pleaser! Cook the potatoes & eggs together at the same time with no extra rack or bowl. So rich & addictive to eat!! 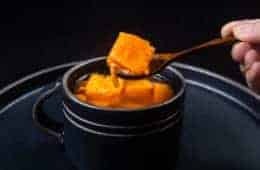 Pressure Cook Potatoes and Eggs: Add 2 ½ tsp fine table salt, 1 tbsp (15ml) rice vinegar or apple cider vinegar, and 4 cups (1L) cold water in the pressure cooker. Submerge all the potato cubes in the water mixture and layer the 3 large eggs on top. Close lid and pressure cook at Low Pressure for 0 minute + Quick Release (the “get up to pressure” time will take roughly 23 - 24 minutes, and the potatoes and eggs will be done). Immediately release the pressure and carefully open the lid. Taste one of the potato cubes to make sure they're done. If your potato cubes are larger, they may need to sit in the hot water for a few more minutes to finish cooking. Place hard boiled eggs in cold water and gently drain the potato cubes with a colander. Prepare the Ingredients: While the potatoes and eggs are cooking, prepare the rest of the ingredients. 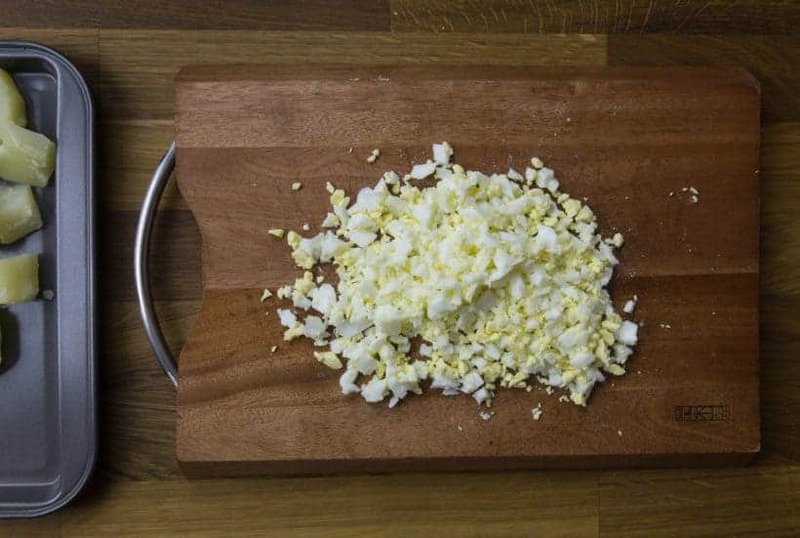 Don’t put away the knife and the chopping board as you will have to finely chop the hard-boiled eggs later. 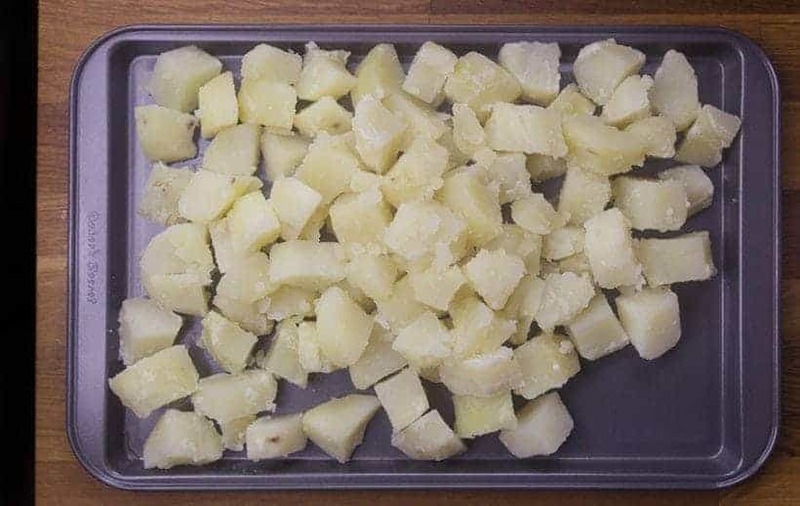 Cool Potatoes: Gently layer hot potato cubes on a large tray. Drizzle and season potato cubes with 2 tbsp (30ml) rice vinegar or apple cider vinegar while they are hot. Let the potatoes cool for 30 minutes. Finely chop the hard-boiled eggs once they are cool to touch. 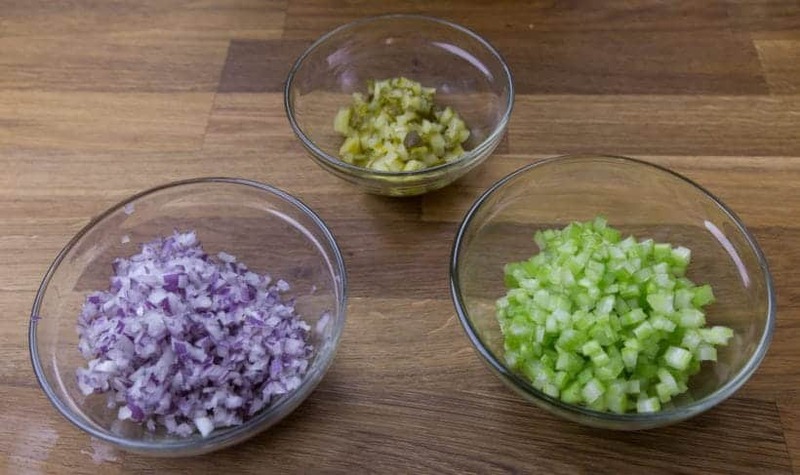 Make Salad Dressing: In a large mixing bowl, add 1 cup (250ml) mayonnaise, finely diced ingredients (red onion, pickle, and celery), finely chopped hard-boiled egg, 1 tbsp (15g) whole grain mustard, 1 tbsp (15ml) rice vinegar or apple cider vinegar, and ½ tsp garlic powder. Mix well with a silicone spatula. Drizzle in the finely chopped fresh dill and mix one more time with a silicone spatula. Gently fold in the cooled potatoes with a silicone spatula. Taste the salad and season with more kosher salt & fresh ground black pepper to taste. Don’t overmix as you don’t want the potato salad to be too mushy. 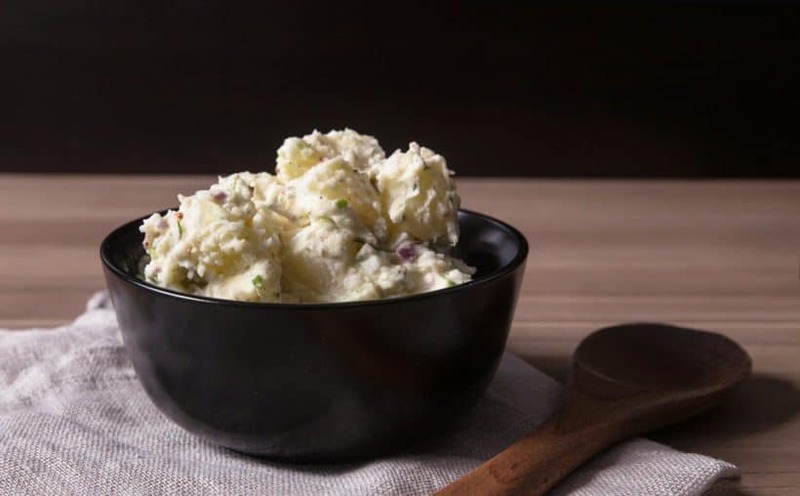 You will want the potato salad to be a little on the salty side because putting it in refrigerator will decrease the perception of seasoning. Serve: Serve as a side dish, bring them to a potluck or picnic! Be sure to print out a few copies of the recipe because I am sure someone will ask. 😀 Hehe! Total Cooking Time: indicated total cooking time excludes the inactive cooling time. Storage Duration: Potato salad will last for 3 days in the fridge or no more than 2 hours under a hot sun! This is the best potato salad I have ever tasted and the only potato salad recipe I will ever need. Hello, I can’t wait to try this but I do have a question. I live alone and want to make it for at least 2 servings instead of 6. Can I use about 3 large russet potato’s and perhaps 2 large eggs? Still cooking time I know. Thank you, looking forward to making this, hopefully, this coming Thursday. It should work just fine!! Thanks so much for this recipe. It’s a huge success at our party. I am totally encouraged to try out more of your recipes! I made this last spring and it’s become a family favorite even during the winter. At first I couldn’t believe the “cook for 0 minutes” and was afraid the potatoes would be under done and the eggs runny. I was new to IP cooking. I’ve learned to trust the recipes from this site. They test everything a multitude of times. Using my IP to cook potato salad has given me an easy to make potluck dish that everyone praises. I get requests for double batches and once for a wedding! When I’m asked for the recipe I always inquire…..do you have an IP.? Between this recipe and the url for pressure cook recipes many friends have purchased their own IPs. 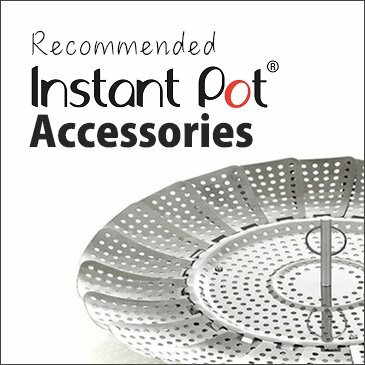 You two have the best Instant Pot cooking site I’ve found. Your comment made our day <3 ! Easy and fast! Love how its laid out for timing as well. Thanks! I made this having to use some substitutions for what I had on hand. I substituted the rice vinegar with white wine vinegar, the pickles with ready made relish and the whole grain mustard with yellow. I also added only egg yolks and not the egg white just for preference. Other than that, this recipe is phenomenal. What a difference the vinegar on the hot potatoes makes, I can’t believe it never occurred to me to do that! I can’t wait to get the actual ingredients and make this exactly as written. Thank you so much for an amazing and simple recipe! Love the rice vinegar. I’ve never had it before. Welcome addition to enhance the potato salad. Excellent! I used a bit of Malt vinegar sprinkled on the cooked potatoes, and I added a bit of chopped cooked bacon. Wonderful potato salad! I usually like a sweet potato salad, but this is the best! 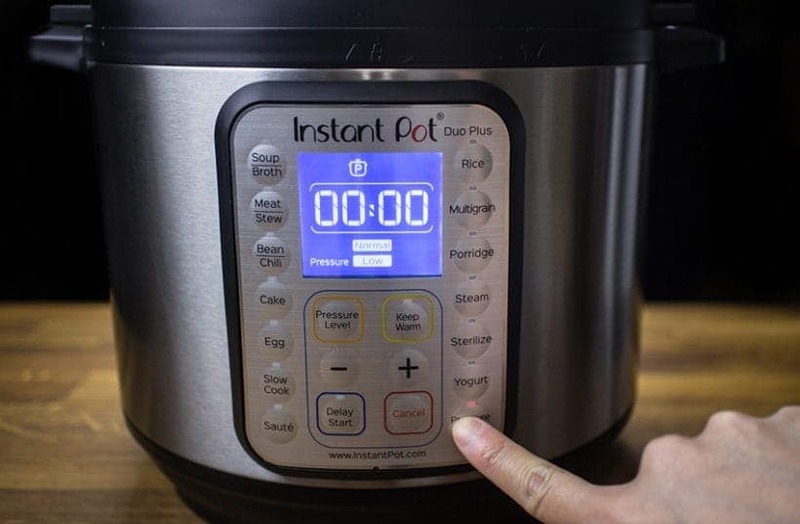 You can adjust the cooking time to 0 minute using the + and – button on the Instant Pot. 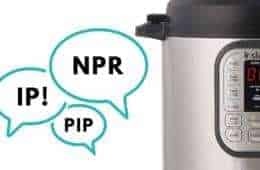 The cooking cycle will end once the Instant Pot has reached the proper pressure. Hi! Can I replace the whole grain mustard with another type of mustard? Which one would you recommend to get a similar flavor profile? Also, I only have dried dill, can I use that and how much? Thanks in advance! Whole grain mustard is hard to substitute. 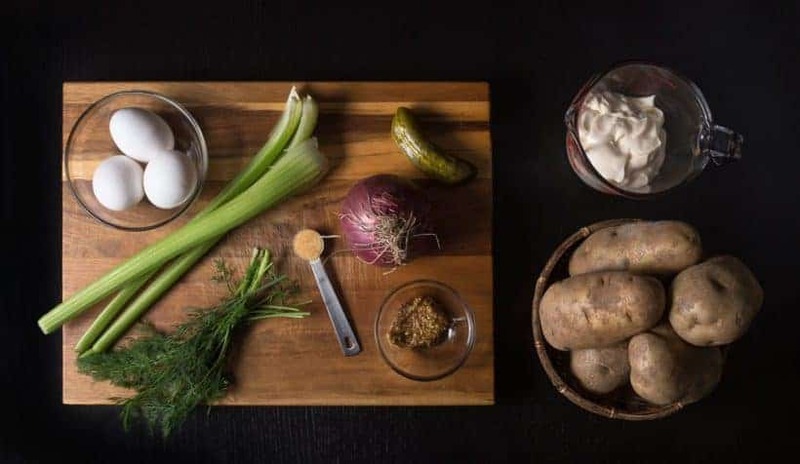 I will say Dijon mustard will also pair well with this potato salad recipe. Dried dill will be quite hard to chew so I recommend fresh dill as the fragrance is awesome for this recipe. I have a question: after cooking the potatoes with the eggs, I released the pressure and opened the lid, and I saw quite a lot of grayish residue on the eggs and on the sides of the pot. It doesn’t look very nice, any idea what it could be? The potatoes seem cooked correctly. The grayish residue sounds like protein to me. It is harmless. Did one of the eggs cracked during the cooking process? I just made this potato salad and it is the best and the easiest I’ve ever made. Used the last one in the chart and followed precisely. I recently purchased a Vidalia food chopper and it chopped everything up uniformly. Love it! This is absolutely the best potato salad I have ever had. It was so easy and simple in the instant pot. I will definitely be making this again! Thank you so much for such a great recipe! Happy to hear you enjoyed it!! I just had to tell you how much I appreciate the tests that you do, but also had to say how much I love the stories that go with the recipes!!!!! Just love that!!!! Happy to hear you enjoy reading the stories! It will be fine without dill. We live in Canada. Fantastic recipe! I used Yukon gold potatoes and green onion instead of red. Love, love cooking both the spuds and eggs at the same time. Both came out perfectly cooked and we really love the nutty flavor of the Yukon golds. Thank you! Looks like a great recipe! If I use 6 or 7 eggs, will the time and pressure be the same? I really like Yukon Gold potatoes for salad. Again, will the time and pressure change? Thanks! The cooking time and pressure will be the same. The increase in eggs will increase the get up to pressure time so the eggs may get overcooked slightly. This is the best potato salad I have ever had. Both the eggs and the potatoes came out perfectly. I will make this again many times! Thanks for your wonderful feedback Sue! 🙂 So happy to hear you’ve enjoyed it too. Have fun cooking & have a lovely summer! I have a power cooker XL, not an instapot. I don’t think it has a low pressure setting. how would I make this with High pressure? not sure how I would do this unless I set it for 1 minute and quick release when it starts to count down?? what do you think? Can the XL be set to 0 minute? If not, give 1 minute and quick release a try at high pressure. I made this and I put it on low pressure, but I think I used “more” not “less” on the setting. The potatoes in this instant cake out a little mushier than I like. All your recipes have been spot on, so maybe I need to make again and change to low pressure and “less”. Thoughts? The less or more setting should not have any effect on the temperature. If more potatoes were used, they will affect the get up to pressure time and can overcook the potatoes a little. 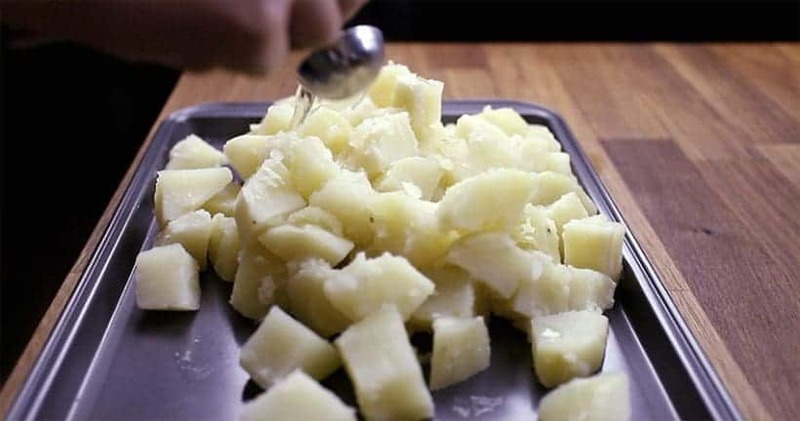 Cutting the potatoes into smaller cubes can also make them mushy as well. I am a self-proclaimed potato salad snob, and I just made this recipe. It’s delicious! The potatoes and eggs were cooked perfectly and the rice wine vinegar adds just the right amount of acid. I’ll definitely make it again! I can’t wait to try this. Just curious, is there any reason I could crack the eggs into a instapot friendly bowl and steam the eggs while the potatoes cook? It would prevent me from having to peel the eggs. That will work as well, but you will probably want to do it separately. The container can act as a shield and undercook the eggs. Please see this recipe as reference and cooking time. Thank you for this recipe and explaining the best type of potato to use in the recipe. I’ve tried other potato salad recipes and the potatoes have always come out way too mushy. I was starting to think my preference for firm potatoes was “odd” lol. This is perfect! I made this for a barbecue this weekend and it was delicious! SO awesome that I could cook both the potatoes and the eggs at the same time! Thanks for your well researched recipe! Hope all have been well for you and your family!! Very clever way to make this! It was quite tasty, however it was a bit on the vinegary side for my family. Next time I am going to add a tablespoon of sugar to the mix and that will cut through the tangy tart flavor I think. I don’t have an instant pot but a power cooker. Would this recipe work the same way in it. I’m wanting to make some potato salad today so I was just wondering. If your power cooker has low pressure, it will work the same. Hi Amy + Jacky, 2 questions: 1) Would I be able to double the recipe in a 6qt , ie, double everything except time? 2) For the eggs, you mentioned in the above comment to maybe use the egg loaf recipe instead because of the build up time so does that mean the eggs in this recipe would need to be cooked separately? 2) Yes, it will be better to make the eggs separately due to the longer build up time. I love the whole idea of doing the potatoes and eggs together. I was able to get the potato salad out of the way and then cook the pulled pork in my IP. However, I must have done something wrong as my eggs were not well cooked… maybe a soft boil. I put the two I had not cracked open on the stove and brought the water to a boil. I have a Ultra, so maybe low pressure is lower on it than on a Duo? Anyway, if you have no suggestions I will fiddle with the times a bit and see what I can do. By the way, I live at sea level so that is not the problem. Thanks again. The Ultra’s low pressure temperature should be identical. All I can think of is less potatoes or eggs were used so the get up to pressure time was shortened (hence the soft boiled eggs). I own a large 8 quart Instant Pot & would like to make a double recipe of your delicious Potato Salad. Do I simply double all the ingredients, including the amount of water & vinegar? And would the time be the same ~ Low Pressure for 0 minute, taking about 23 minutes to get up to pressure?? Or what adjustments do I need to make, so the doubled quantity of potatoes & eggs get properly done? P.S. I LOVE your creative, well-tested recipes. I had never, ever made yogurt in my life… I made your Instant Pot Yogurt #12, & it turned out fantastic!!! Yes, including the amount of water & vinegar. The cooking time will be the same, but you will have to make the following adjustment. I would recommend cooking the eggs separately. The eggs will probably get overcooked as the get up to pressure time will be a lot longer due to more ingredients are in the pot. I would recommend cutting the potatoes slightly larger. Maybe 1.25″ cubes to compensate for the longer get up to pressure time. Hi, I am new to using an Insta pot and I want to know if I can Hard boil a dozen eggs at one time and how to do it? I would recommend trying 4 – 5 minutes at low pressure then quick release with 12 eggs. The “less” will not work the same as it is still High Pressure. My Instant Pot Lux doses not have a low pressure button, how would I get low pressure? The LUX doesn’t have low pressure mode available so you will have to make this with High Pressure. 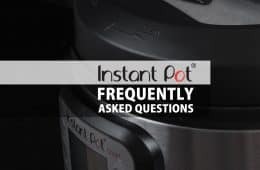 The 23 – 24 minutes is how long it will take the Instant Pot to heat up to get up to pressure (from cold to boiling to generate enough steam to get Low pressure). Low pressure 0 minute means the potatoes and eggs are done cooking as soon as the Instant Pot has gotten to Low Pressure. Happy New Year and have fun cooking! So so good. I made this to go with gumbo and my husband had two bowls. Very good! Thank you. Hope you had a wonderful Christmas holiday & wish you a blessed New Year! I wasn’t sure about the “0 minutes on low pressure” would work but it totally worked and cooked the potatoes! My husband and I are picky potato salad eaters and this recipe nailed the flavor. I’m loving my IP more and more with your recipes. Thanks for all of your efforts, they are really much appreciated! Thank you so much for using our recipes!! 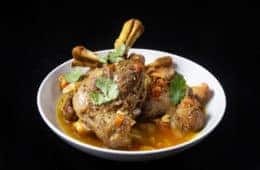 I just wanted to drop a comment and tell you how much I love this recipe! I’ve been making potato salad for years, and every bite I take of yours makes me think how fantastic it is. Today I had a flash of inspiration and used a julienne tool on the celery, pickle, and even the onion. It saved me some time and gave me more uniform pieces. For those like me with only half decent knife skills, it worked great! Thank you again for all your efforts. 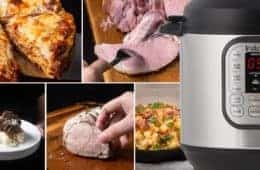 You guys are my go to for electric pressure cooker recipes. Keep up the awesome work! So happy to hear from you Mike! The julienne tool sounds like it will save a lot of time. I will have to look into that! Wonderful potato salad! Simple, classic. Thanks s’much! Have fun cooking & take care! I made this tonight and it was AMAZING! The best potato salad I’ve ever had! I am not a fan of celery and pickles so I left them out, but still put in the dill. I may eat the whole thing myself! I love that I could cook the potatoes and eggs at the same time. Thank you Amy and Jacky!! I just need to make sure I read it correctly. 1) Low-pressure button Zero minutes? The potatoes and eggs will be cooked. I normally can’t cook potato salad correctly in regular pot. Yes, low pressure button for Zero minutes then turn the venting knob to the venting position to quick release. I’m using dried dill instead of fresh. Anyone know the measurement for dried dill? I love that you did the comparison. This is the information I like to see and learn from. Worked out beautifully. Thank you! I appreciate the nutrition information statement since I’m cooking for a diabetic. Question is how many many servings does the nutrition info refer to? 4, 6, 8? Do all your recipes assume the same number of servings (unless otherwise stated)? I look forward to trying this as I learn to use an instant pot. Thanks for the recipe. You can find the serving size under the recipe card. Beside the Blue Printing button. I saw in one of the forums they cracked the eggs into a stainless steel bowl and cook it together with the potatoes. Do you think this will work with your low pressure method? Haven’t tested Kathy Grant’s method with this recipe yet, but I think it will work! I love potato salad. I just made my best-ever using your recipe. I cooked unpeeled, cubed red potatoes with the eggs on top in my instant pot using your #7 method (low pressure, 0 minutes). The dressing was delicious. I think the vinegar gives it that extra tang – yum! thank you so much for your kind words and sharing your cooking experience with us! This potato salad is amazing. I made it for my family and used Duke’s mayo. We all loved it. Glad your family enjoyed the potato salad! 🙂 We can’t wait to make it again. Once the instapot reaches pressure 0 it goes to keep warm. Do I still leave the potatoes in for about 23 min? Or take out when it switches to warm? Thanks! You will want to take out the potatoes once it switches to keep warm mode. Thanks for testing and finding the best cooking procedure! We are so happy to hear the result!! Ran out of mayo at the 1/2 cup mark so had to top up with some full-fat greek yogurt and a splash of yummy full-fat buttermilk. Otherwise followed the recipe to the letter and it was fantastic! Full-fat Greek yogurt is a great substitution for mayo! The potato salad was a big hit! Your suggestions for the adjustments to make half the recipe worked perfectly. The potatoes were done just right and didn’t need to sit in the hot water after the quIck release. I made two eggs instead of one. I also added a tablespoon of Sierra Nevada Pale Ale Honey Mustard for added zip and flavor…Awesome! Thank you for letting us know the result and your modifications! Sounds perfect! I will let you know how it comes out! Thanks for all your help (and all those delicious recipes)! What adjustments would I need to make for half the recipe? The full recipe is too much for just the two of us! I would cut the potatoes & dressing ingredients portion to half. The 4 cups of cold water/salt/vinegar and cooking time will stay the same! Since the get up to pressure time will decrease, you may want to check the potatoes after the quick release. They may need to sit in the hot water for a few more minutes to finish cooking. I did not know we could pressure cook on LOW for “ZERO” minutes! Thank you for experimenting for all of us! The water level can remain the same. 5 lbs of potatoes will increase the get up to pressure time, so the potatoes may overcook a little! The potatoes buffer the eggs from overcooking? I would never cook eggs that long? Also, no issue with anything on the outside of the eggshells contaminating the potatoes? The eggs look like this after pressure cooking with the potatoes (very slightly undercooked). No issue with contamination as everything will be pasteurized during the cooking process.